To the city of Florence belongs the glory of giving to the Church the seven youths who formed the nucleus of the order: Buonfiglio dei Monaldi (Bonfilius), Giovanni di Buonagiunta (Bonajuncta), Bartolomeo degli Amidei (Amideus), Ricovero dei Lippi-Ugguccioni (Hugh), Benedetto dell' Antella (Manettus), Gherardino di Sostegno (Sosteneus), and Alessio de' Falconieri (Alexius); they belonged to seven patrician families of that city, and had early formed a confraternity of laymen, known as the Laudesi, or Praisers of Mary. While engaged in the exercises of the confraternity on the feast of the Assumption, 1233, the Blessed Virgin appeared to them, advised them to withdraw from the world and devote themselves entirely to eternal things. They obeyed, and established themselves close to the convent of the Friars Minor at La Camarzia, a suburb of Florence. Desiring stricter seclusion than that offered at La Camarzia, they withdrew to Monte Senario, eleven miles north of Florence. 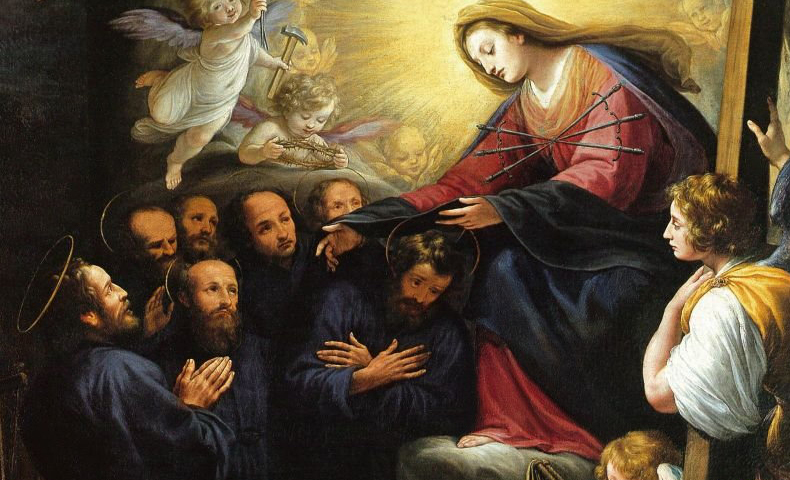 Here the Blessed Virgin again appeared to them, conferred on them a black habit, instructed them to follow the Rule of St. Augustine and to found the order of her servants (15 April, 1240). The brethren elected a superior, took the vows of obedience, chastity, and poverty, and admitted associates. In 1243, Peter of Verona (St. Peter Martyr), Inquisitor-General of Italy, recommended the new foundation to the pope, but it was not until 13 March, 1249, that the first official approval of the order was obtained from Cardinal Raniero Capocci, papal legate in Tuscany. About this time St. Bonfilius obtained permission to found the first branch of the order at Cafaggio outside the walls of Florence. Two years later (2 Oct., 1251) Innocent IV appointed Cardinal Guglielmo Fieschi first protector of the order. The next pope, Alexander IV, favoured a plan for the amalgamation of all institutes following the Rule of St. Augustine. This was accomplished in March, 1256, and about the same time a Rescript was issued confirming the Order of the Servites as a separate body with power to elect a general. Four years later a general chapter was convened at which the order was divided into two provinces, Tuscany and Umbria, the former of which St. Manettus directed, while the latter was given into the care of St. Sostene. Within five years two new provinces were added, namely, Romagna and Lombardy. After St. Philip Benizi was elected general (5 June, 1267) the order, which had long been the object of unjust attack from jealous enemies, entered into the crisis of its existence. The Second Council of Lyons in 1274 put into execution the ordinance of the Fourth Lateran Council, forbidding the foundation of new religious orders, and absolutely suppressed all mendicant institutions not yet approved by the Holy See. The aggressors renewed their assaults, and in the year 1276 Innocent V in a letter to St. Philip declared the order suppressed. St. Philip proceeded to Rome, but before his arrival there Innocent V had died. His successor lived but five weeks. Finally John XXI, on the favourable opinion of three consistorial advocates, decided that the order should continue as before. The former dangers reappeared under Martin V (1281), and though other popes continued to favour the order, it was not definitively approved until Benedict IX issued the Bull, "Dum levamus" (11 Feb., 1304). Of the seven founders, St. Alexis alone lived to see their foundation raised to the dignity of an order. He died in 1310. Connected with the first order of men are the cloistered nuns of the second order, which originated with converts of St. Philip Benizi. These sisters have convents in Spain, Italy, England, The Tyrol, and Germany. The Mantellate, a third order of women founded by St. Juliana (see SERVANTS OF MARY), have houses in Italy, France, Spain, England, and Canada. In the United States they are to be found in the dioceses of Sioux City and Belville. There is also a third order for seculars, as well as a confraternity of the Seven Dolours, branches of which may be erected in any church.